Born on January 3,1941, in New Haven, Connecticut, she was the second of eight children and daughter of Thomas (owner of Chieppo Bus Company) and Mary Chieppo (housewife). Teaching High School English from 1967-1977. Mary Alice, later, while raising a family, taught a creative writing class at an Adult Education Center in Springfield, Massachusetts. While working on her doctorate, she chose to work with adults in an Elderhostel. It was here that she "Fell in love with the population" and became interested in adult development. Honors include: Charter Fellow, Association for Gerontology in Higher Education, 1997; Fellow, Gerontology Association of America, 2002. In addition to the honor of Official Citation, from the state of Connecticut, she received an Honorary Citation from the Department of Elderly Services also from the state of Connecticut. She was also awarded the Best Dissertation Award from the Massachusetts Society of Gerontology. 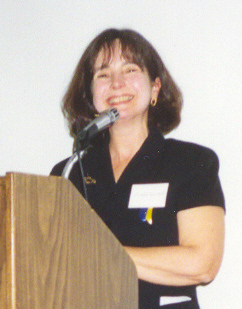 Mary Alice is currently the director of the Institute of Gerontology at St. Joseph College, in Hartford, Connecticut. She is married to Dr. Anthony E. Wolf, noted adolescent psychologist and best-selling author; they have two adult children, Nicholas and Margaret. Her interests include art and antiques. 1967-1971--High school Teacher, New York City, N.Y.
Click here to see a list of these citations. The experience of older learners in adult education with a focus on the developmental task of life review. Doctoral dissertation, University of Massachusetts, Amherst. Available from the University Microfilm International, Ann Arbor, MI 48106. (1982). The older adult learner: Education as a means to one's past. ERIC Publication, CE 037 524.(1984). The experience of older learners in adult education. Lifelong learning, 8, (5), 8-11. (1985, February). Tapping the world of the older adult. Excerpted in Resources in Education (National Institute in Education). Also ERIC Publication ED 249 366, CE 039 785. (1985, March). The meaning of education in late life: An exploration of life review. Gerontology and Geriatrics Education, 5 (3), 51-59. (1985). Growth and development with older women religious. Lifelong Learning, 9 (4), 7-10, 28. (1986, January). Motivation in late Life: The personal need for challenge. ERIC Publication ED 262 196, CE 042 575. (Excerpted in Resources in Education, National Institute in Education.) (1986). Living with your role. Instructional video-tape. Hartford, CT: Consortium for Gerontological Education in Long Term Care. (with Metcalf, R., 1987). Late life development: New beginning. Hot Flash Newsletter for Mid-life and Older Women, 6 (2 & 3), 1, 8. (1987). Human development, gerontology, and self-development through the writings of May Sarton. Educational Gerontology, 13, 289-294. (1987). Backwards and forwards: An approach to understanding the older learner. Excerpted in Resources in Education. (National Institute in Education). ERIC Publication ED 279 784, CE 045 055.(1988). Selfhood and the older learner: The promise of education. ERIC Publication ED 290 895. (1987, August). In-depth interviewing: Training students of gerontology to enter the subjective worlds of elders. Educational Gerontology, 14 (2), 129-135. (1988). Sharing educational resources among long-term care providers. Educational Gerontology, 14 (2), 229-235. (with Nahemow, L., Casey, J., Gauthier, Lusky, R., 1988). Selfhood and the older learner. Newsletter of the Boston Society for Gerontologic Psychiatry, Inc., 1 (8), 1, 6. (1988). Reminiscence: A gift from the aged. In E.A. Secord (Ed.) Parish Social Ministry for Older Adult. Hartford, CT: Archdiocese of Hartford Office of Urban Affairs. Also excerpted in From the Rooftops, newsletter of Saint Mary Home, West Hartford, CT. (1989). Affective training for human service providers. Lifelong Learning, 12 (7), 18-20. (1989). Journal writing: A means to an end in educating students to work with older adults. Gerontology & Geriatrics Education, 10 (1), 53-62. (1989, October). The crisis of legacy: Life review interviews with elderly women religious. Journal of Women & Aging, 2 (3), 67-79. (1990). The call to vocation: Life histories of elderly women religious. The International Journal of Aging and Human Development, 31 (3), 197-203. (1990). The discovery of middle age: An Educational task in training gerontologists. Educational Gerontology, 17 (6), 559-571. (1991). The older learner. ERIC Publication ED 338 870, CE 059 572. Excerpted in Resources in Education. (Office of Educational Research and Improvement, U.S. Department of Education). (1992, April). Personal development through learning in later life. In L.A. Cavaliere & A. Sgroi (eds. ), Learning for personal development: New directions for adult and continuing education (No. 53. ), pp. 73-84. New York, Jossey-Bass Inc., Publishers. (1992, Spring). Older adults and reminiscence in the classroom. Adult Learning, 3 (8), 19-21. (1992). Explorations into spirituality. Aging and the Human Spirit, 2 (2), 9, 11. (1992, Fall). Mentoring middle-aged women in the classroom. Adult Learning, 4 (5), 8-9, 22. (1993). Older adults: Learning in the Third Age. ERIC Clearinghouse on Adult, Career, and Vocational Education (information Series no. 357). (1994). Gerontology for Companions: A model curriculum. Journal of Case Management, 4 (4) (with Raisz, H.M., 1995, Winter). Brief bibliography: Education and the older adult. Washington, DC: Association for Gerontology in Higher Education. (with Luckie, J., 1995). Connecting with older adults: Educational responses and approaches. Malabar, FL: Krieger Publishing Co. (with Beatty, P.T., 1996). Book review: Changing concepts of retirement: Educational implications. International Journal of Lifelong Learning, 16. (1997). Gerontology for Companions. West Hartford, CT: Saint Joseph College. (with Whitman, C., 1997). Transformation within the classroom experience. ERIC Publication. (1998). Gender shift across the lifespan. In M. A. Wolf & M. Leahy (Eds. ), Adults in transition. Washington, DC: American Association for Adult and Continuing Education. (1998, Winter). Gender shift through adulthood: Educational responses to changing lifespan roles. ERIC Publication ED 401 384, CE 072 728. (1998). Adults in transition. Washington, DC: American Association for Adult and Continuing Education. (Co-ed. with Leahy, M. 1998). Using learning to meet the challenges of older adulthood. New Directions in Adult and Continuing Education. San Francisco: Jossey-Bass Publishers. (Co-ed. with Fisher, J.C., 1998). Kinds of love by May Sarton: A theoretical framework for training gerontologists. Educational Gerontology, 25 (4), pp. 317-330. (1999). New approaches to the education of older adults. Resources in Education, ERIC Document ED 423-430. (1999). Education for older adults. In Handbook 2000: Adult and continuing education. A.L. Wilson and E.R. Hayes (Eds. ), San Francisco: Jossey Bass-Publisher. (with Fisher, J.C., 2000). Review Thearapeutic interventions and ethnic elders. Binghamton, NY: The Haworth Press, Inc. (2000). Older learners: Inner reflections. International Journal of Qualitative Studies in Education. (in preparation). The Diary of A Young Girl by Anne Frank: The potential of human development. (in preparation).